Chadis Crafts' Chanukah Crafts, Links, Recipes and More! 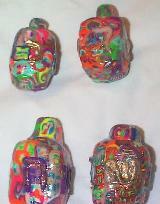 Has Eileen's Original Beadie designs for Tie Dye Dreidel, Glow in the Dark Dreidel and Menorrah Beadies. Let me know if you design any and I will add them to my site giving you credit or course. See my beadie animal page for 100's of general patterns and instructions. Clay Stamps. Including Chanukah and Chanukah Jewelry. More designs and lessons coming. This is a new list of more of my own Chanukah craft ideas as featured in article on Shalom Boston's Web site. Plus they have their own list of Chanukah Links. Don't forget my Jewish Scouting Links. Remember to hit reload ever time you come to Chadis Crafts, as I update frequently and most computer networks save old copies to "help" you. 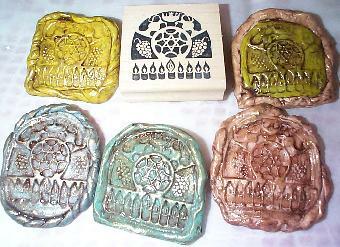 Jewish candy and chocolate molds. Some hard to find Jewish molds for making candy. If you buy extra you can use them for plaster, soap etc. Love the extra large seder plate mold, Purim molds and more! They sell supplies for soap and candies but you will have to check with them but they say many are Kosher. They just got in parave baking chocolate in white and dark. YUM! They have some great Chanukah molds, cookie cutters and supplies, including sugar shapes to put on cakes or cup cakes in the shape of driedels and Menorrahs! Wood kits sold in bulk. Purim, Chunukah, Shabbat and more. 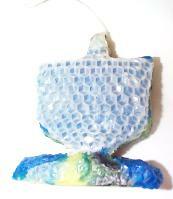 Groggers, dreidels, yads and more! All look to be in quality wood products perfect for the classroom, for home schoolers and camps. Sold individually and in bulk discounts. They have Chanukah information, recipes, games and more! Has a few other Jewish style recipes. Chadis Crafts has a great selection of Chanukah Jewelry.